New York (TADIAS) – Few have popularized Ethiopia and the banner of green, yellow and red on the global stage as much as Bob Marley, and we are always happy to see the legend being celebrated. 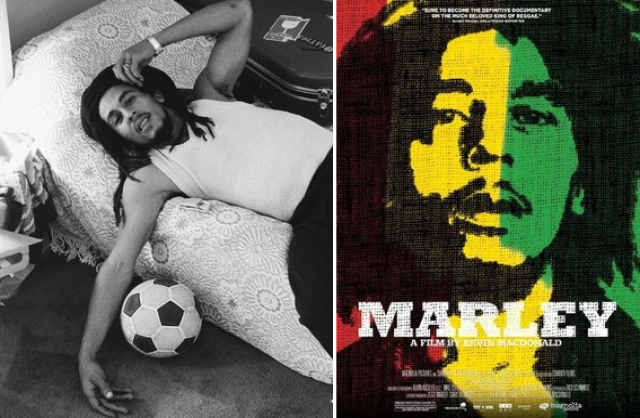 A new film entitled Marley, directed by Oscar-winner Kevin Macdonald, is the first documentary approved by the music star’s family. According to Marley, the following day after his historic concert at Madison Square Garden in New York City in September 1980, Bob Marley was diagnosed with late-stage cancer. He died eight months later at the age of 36. Marley’s funeral service was held on May 21st, 1981 at Holy Trinity Ethiopian Orthodox Church in Kingston, Jamaica and at The National Arena. It was officiated by the late Abuna Yesehaq Mandefro, the Archbishop of the Ethiopian Orthodox Church in the Western Hemisphere at the time. The fascinating two-and-a-half-hour biographical documentary gives us insight into Marley’s entire life, featuring rare interviews with his family, friends, and others, including Bunny Wailer and Lee “Scratch” Perry. I watched it on Friday. The most amazing documentary ever made on Bob Marley. Believe me I have watched all of them! Two thumbs up! Bob Marley is one of the most important musicians in the history of music! Bob Marley’s songs have been and are, and continue to be a sounds track for many generations to come. I am pleased to see this big screen tribute! It is a great movie, but given that it was a 2 and half hour video, it only focused mostly on the positive side of bob Marley! Having said that, still it is an incredible film-making and memorable!! I learned a lot of things that I did not know about bob and humanity of a gifted soul!! It’s a must see!! Great film..just watched it! All Rise to the Great Berhane Selassie. Ethiopia is proud to have a son from so far away tell the people the truths & rights.